The Galway bid for the European Region of Gastronomy 2018, entitled ‘From the Ground Up – Feeding our Future’, focused on five key areas following a stakeholder engagement workshop in September in Galway. 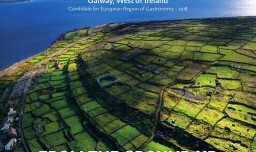 During the bid feedback session that took place at the European Region of Gastronomy Partners’ Meeting in North Brabant 16-18 March 2016, the jury applauded the Galway ‘grass roots initiative’ approach in terms of embedding this work across communities and schools. Education and health were seen as critical components of any future projects and the bid team used this feedback to guide the bid book development. A programme of work will be identified in the coming weeks and projects will begin in the coming months. The European Region of Gastronomy judges will visit West of Ireland from 24-26 May 2016. In June, the formal award will be presented at a European conference in Aarhus, Denmark by EU Irish Commissioner for Agriculture and Rural Development Phil Hogan.